We sat at a large, round table in the special education classroom with half of us seated uncomfortably in child-sized plastic chairs. My wife, our advocate, and I sat on one end of the table. The district’s lawyer, psychologist and special education coordinator, the school’s principal and special education teacher, my son’s second-grade teacher, and his aide filled the remaining seats. We were reviewing my son’s IEP that had just been approved. After two years of providing our own DIY education for our son under a makeshift 504 plan, we hired a lawyer to finally get my son a formalized education plan and the protection that it affords him. It was clear as we reviewed the supporting documentation that we needed that protection because the system is not set up for children like him. It was even more clear as we reviewed his test results that they didn’t really know my son. They made comments about his learning without fully grasping how hard he works when he is outside their walls. They made judgments based on a few hours of testing and observation but they didn’t really understand him or what he was going through. When the special education teacher said that she had other kids with epilepsy, I cringed. “I had another kid with epilepsy” is like saying I’ve seen one shade of blue. The spectrum of what epilepsy is to a person is as broad as the hues and tones that make up every color imaginable. This wasn’t the first time that someone at my son’s school generalized epilepsy. The one-size-fits-all seizure plan hanging in the nurse’s office is another symptom of the lack of understanding around his condition. Sometimes, having a little knowledge and convincing yourself that you know everything about something is worse than having no knowledge at all. So we did what we always do and explained how epilepsy is different for everyone and how it affects our son specifically. We know that won’t be the last time we need to provide that explanation because awareness never ends. There will always be a new school year. Every time a new person comes into our lives, it is an opportunity to help them understand my son. It’s an opportunity to help them understand epilepsy from the perspective of a child and a family living it every day. It is not always easy. 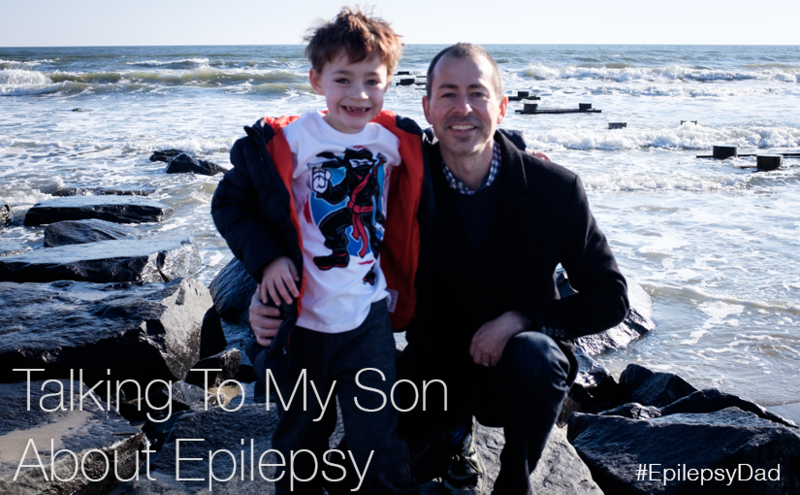 It’s not easy to retell the story of how epilepsy tried to take our son. It’s not easy to describe how hard he has to work every day or to explain how epilepsy is more than just seizures. But every time we do it, we create understanding. It makes the world around my son a bit more accepting of him and his condition. And, I hope, it creates a bit more understanding in the world for other children like him. NEXT UP: Be sure to check out the next post by Clair at http://www.epilepsybumps.com/. Imagine we are sitting at a table across from each other. I’m trying to teach you a complicated concept. Except I don’t understand the concept, either. And I’m also trying to teach it to you in another language. Except neither of us speaks that language. And the room we are in is pitch black. That is what it is like to talk to my son about epilepsy. It’s a topic that I didn’t have a reference for until it entered our lives. I’m learning what it means to be the parent of a child with a disability, but not what it means to have epilepsy. My son has a different perspective. He knows what it feels like to have epilepsy, but he doesn’t have the words to always share what he is going through. He doesn’t remember his life before seizures enough to describe the difference. So we fumble as we try to connect and create a shared experience. Occasionally, I’ll be able to pull something out of my growing knowledge bank to share with him. A few weeks ago, we strolled through Caesar’s Casino in Atlantic City. We passed a statue of Julius Caesar and I mentioned that he ruled the Roman Republic. I also mentioned that he had epilepsy. “He had epilepsy and he ruled the world, ” I said, “so you can do anything that you want to do.” I skipped the part about Julius possibly suffering from migraines and not seizures. The opportunity for bonding was more important than proven historical accuracy. There are flashes of a connection, but not enough of one. Epilepsy and seizures will affect him for the rest of his life. History lessons might be inspirational, but they don’t explain what he is feeling and why. They won’t build his epilepsy vocabulary. They might keep him hopeful, but they can’t predict what it will be like for him in the future. Nothing can. As a father, it makes me feel helpless. It’s my job to protect him. It’s my job to teach him the ways of the world. I think that if I do more research, if I learn more facts, that I’ll somehow be able to forge a path for him. If I can’t make him better, I at least want to make his life easier. But without knowing what he is going through, I’m never sure I’m doing the right thing. What I can do, and what helps me balance my frustration, is loving him and making him feel secure. Sometimes, there is light in the room. I’m able to see how brave he has become when he tries something new, talks to people, or jumps fifteen feet into a ball pit. I see how hard he works to do basic tasks and how much harder he has to work to do the things he likes doing. There is enough light to see that our family is around the table, trying to connect with each other. We’re still not speaking the same language, but there is enough light to see that we’re in this together. This week, my wife and I are meeting with my son’s school to update his 504 plan. 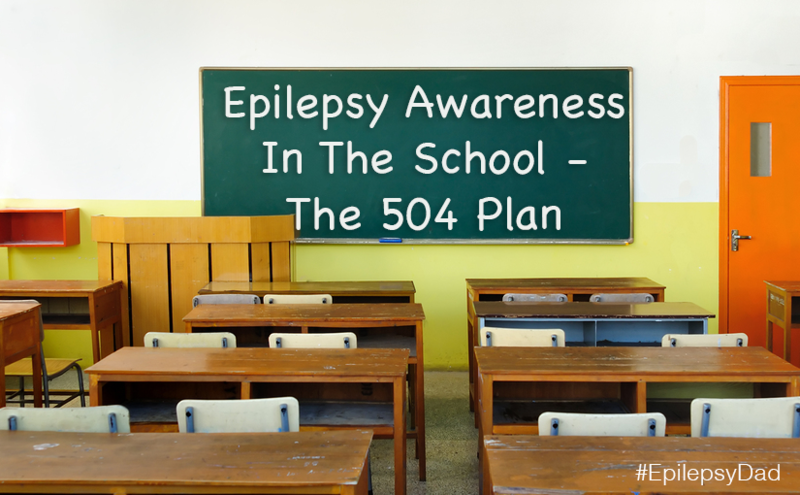 A 504 plan is intended to ensure that a child with a disability has access to learning and receives accommodations to help them succeed academically. In my son’s case, his plan outlines breaks, seating placement, a shortened school day, and special assistance for attention and behavioral issues. The plan is put together collectively by the parents, nurse, teacher, and school district with input from my son’s medical team and support services and it is meant to be a “living document” that will change as my son’s condition or capabilities change. This is our first year with a 504 plan. Even though we’re only a few months into the school year, we are pulling the team together to make adjustments. Some changes are good, such as lengthening his day since his endurance has improved. We also have a better sense of how he handles the day, so instead of basing his breaks strictly on a time, we can place them after harder tasks so that he can spend more time in the classroom with his peers. But we also need to address some issues that many parents of children with epilepsy face when trying to get the right services for their child. Epilepsy is included in the class of conditions called “invisible disabilities”. While a seizure itself might be external, many of the effects surrounding epilepsy are internal. Fatigue, depression, and problems with attention and cognition are just some of the issues that my son deals with every day. On the outside, he might look like a normal 7-year-old boy and it’s easy to want to treat him that way. Too many times my son doesn’t get a break that he needs because he “looks fine” but, by the end of the day, he’s so physically exhausted that, not only is he not actually learning anything, he has more seizures that night and the next morning that cause him to start the next day already exhausted. It’s only after a few days following seizure-filled nights that my son physically fits the “sick kid” profile. Epilepsy covers a broad range of seizure disorders. A teacher mentioned that she had a student with epilepsy that would have a seizure, sleep at her desk, then wake up and be fine. When she described that experience, she did so in a “don’t worry, I clearly know epilepsy so I’ve got this” tone that raised the “you don’t got this” alarm bells in my head. Epilepsy is more than just seizures and there are an infinite number of variables surrounding the seizures that make each case unique. My son rarely has seizures during the day, but depending on how tired he is, he may have more at night and in the early morning hours, which affects how rested he is going into the next day which perpetuates the problem. The state of his brain at any given moment dictates his behavior and his ability to retain and recall information. His head is constantly swimming in medication and the side effects of those medicines are exacerbated depending on his cognitive load, seizure burden, and his physical condition. So not only are not all cases of epilepsy the same, but people with epilepsy can show a wide range of symptoms and effects on any given day. “All kids his age…” Anytime someone starts a sentence with that phrase, I know that I’m going to have to break out the soapbox. First, “all kids” don’t do the same thing. But most importantly, the behavior that looks like the “normal” attention problems of a first grader are actual misfirings of the neurons in my son’s brain that are preventing him from recalling any information. The glassy eyes and the “no one is home” look could be the result of a seizure or the way that his medicine is affecting him today so his extra-slurred speech and his frustration trying to piece together a complete thought are not normal development problems, either, especially when they vary throughout the day. Even with the best intentions, treating something as “normal” has both the risk of setting my son up to feel like a failure because he can’t control what is happening to him and prevents the identification of what is actually causing the behavior and the ability to address that cause. We are very new to this world, but we are extremely grateful to have a wonderful support network around us and to have had many people go before us and share their lessons. To continue on in that spirit, here are a few of the lessons that I have learned that may help you navigate this long, difficult road. Balancing my desire to have the world treat him as a “normal” kid and making him feel like a normal kid with the reality that he has special needs is a challenge I face every day. Not everyone else does or has a reference for what that means. Having a dialog with the teachers and the school district and talking about their perceptions is an important piece of having everyone on the same page. “It’s great that you have seen a seizure, but here is how my son is different from that other student.” As the teachers have more interactions with my son, and as we continue to talk about what they have seen and what things we are seeing at home, we’ll all have a better picture and be able to adjust the plan to better suit my son’s needs as they continue to change. My wife and I have talked leading into this meeting about what is working with his current plan and what isn’t working. We’ve talked about what things we need to bring up, how to bring them up, and what documentation we need to provide to support our position, and we will have that documentation available. Doctor’s reports, neuropsychological tests, reports from wraparound services. Perceptions are hard to change but the best way to support the request for services that your child needs is with data. One of the best resources that we have available to us is our support network. Other parents that work tirelessly to navigate the system, social services through the hospital and the state, and epilepsy groups such as the Epilepsy Foundation of Eastern Pennsylvania that have programs to bring epilepsy education into the classroom. This network provides the guidance and information we need to ensure that we are asking the right questions and asking for the right services for our son. In some cases, we’ve brought people from this network into these meetings. In the end, we have built a team that we can leverage to do what is best for my son. If you’re averse to conflict like I am, get over it. It may seem like the system is set up to oppose these special services. They cost money, they disrupt the normal flow and structure of the school day, and especially with an “invisible disease”, the system may try to convince you that your child doesn’t need these services. As we’ve been told many times, there is no one that will be a bigger advocate for our son than us. Be that voice. Partner when you can. Fight when you must. There is a lot of good information about what to ask for in a 504 plan, and I wanted to share these links that I found useful. If you have other suggestions or resources to share to help other parents going through this process, please share them in the comments. 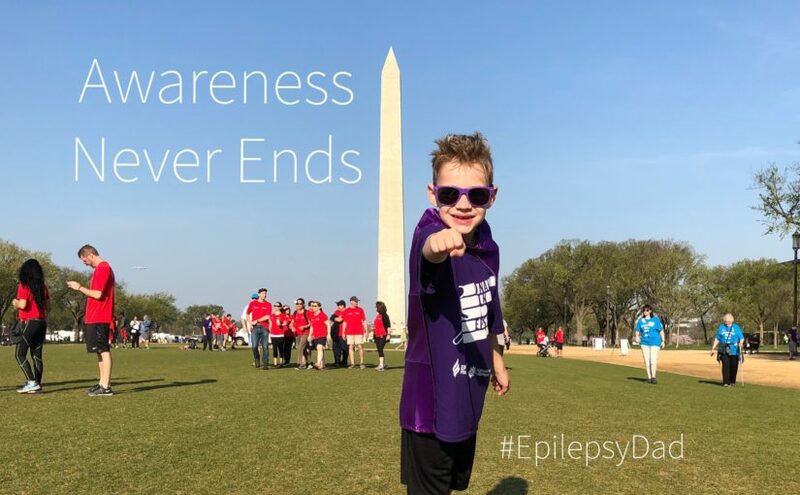 NEXT UP: Be sure to check out the next post tomorrow from Eisai/Sean at livingwellwithepilepsy.com for more on epilepsy awareness. For the full schedule of bloggers visit livingwellwithepilepsy.com. And don’t miss your chance to connect with bloggers on the #LivingWellChat on November 30 at 7PM ET.